It was my first digital dance off. 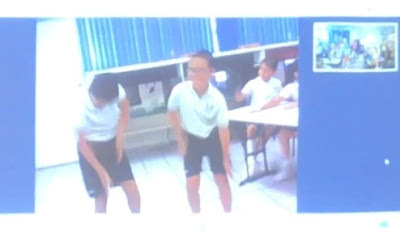 There was flossing, electro-shuffling, orange justice-ing. And of course: some dabbing. And through it all, a connection was forged. My first Empatico experience was a wonderful testament to the power of connection to develop empathy. Empatico, an initiative of the Kind company, is one of the easiest ways to connect your class for #ClassPartnerships. The platform facilitates not only with whom you connect, but how. It is like a dating service that not only sets you up with a great match but books your restaurant reservation, drives you to the rendezvous, and loads you up with snappy conversation tidbits to make you shine. 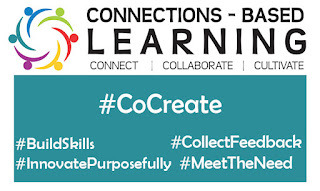 Whether you have never connected your class or you are a connections-based learning veteran, if you have students ages 7-11, you have got to check out this platform. Not sure who to connect with? Easily solved! Empatico uses info from a few quick questions to connect you with the right learning partner. Not sure what to talk about? No problem! Empatico offers eight different topics to choose from. Each topic opens the door to your students sharing a bit about their neighbourhood, their home, their life. Not experienced in Skype or Google Hangouts? No worries! Empatico has its own connection platform. It is as easy as clicking a button. I am very fortunate to know Kristen Abeywardene. When I proposed setting up her grade 4/5 class with the always free Empatico app, she got down to business right away. She signed up that afternoon. Empatico used her activity choice (Local Landmarks), student age, and times available to connect us with a class in Hermosillo, Mexico. Our students prepared info to share about their chosen landmarks: Riverview Hospital, city hall, Rogers Arena. Meanwhile, the class in Hermosillo was doing the same. When the time for the connection came, up popped a notification. As I said, connecting was as easy as clicking a button. After some introductions, students began to share. The student presentations were on their school laptops. I held the laptops in front of the screen as students described their landmark to their Mexican learning partners. The students from Mexico did the same. But the conversation moved well beyond landmarks. Students began seeing what they had in common and began connecting. When the students began dancing in front of the camera as they shared their favourite dance moves, I really saw how a simple connection can spawn empathy. There was laughter, agreement, understanding. What is empathy? Simply put, empathy is "the ability to understand and share the feelings of another" - Oxford Dictionaries . Clearly, these students were building a mutual understanding. They were seeing how they were alike. They were sharing feelings. With empathy, there is equality. Developing sympathy is good. But it conjures up an image of inequality, like ivory tower folk looking down on the poor peasants below wondering what can be done for them. When we empathize, we share feelings. We see our commonalities. We develop a #BetterUs. 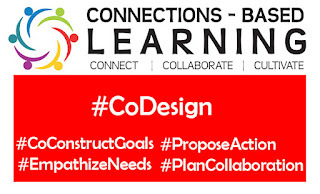 In connections-based learning, one of the aspects of #CoDesign is #EmpathizeNeeds. The idea here is that through connection, we feel the needs of another. And we come to understand how to respond. The Empatico platform sets students up to do just that. I encourage elementary educators to visit the Empatico site and get connected. And let me know how it goes!! It is so important to reflect. I don't have a great memory. I can enter a room and be clueless as to why I came. And yet I remember stories from decades ago as if they were yesterday. Building tree forts. Ducking behind the fence as my buddy threw lawn darts at me. Getting stitches. Why do I remember those things: because I have reviewed them over and over. I have reflected on them. Sure, as I tell the stories to my own kids, some of the details have evolved. (the darts really did happen, though). But without reflection, the ideas grow cold. With that in mind, here are a few of the more memorable CBL experiences I had this year. 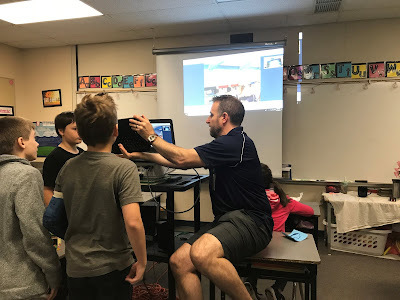 This was a great year of connections-based learning for me and my students. I remember the first week of school, I connected my students with Saul Mwame, a Sustainable Development Goals activist from Tanzania. I really had no definite purpose for this other than connection. Sure I thought he could shed some light on the lack of electricity in Tanzania. But it was the connection that was important. Months after that first semester class is done, I see the ripple effects of that connection in my last semester's students' tweet supporting Saul's goals. Nothing can stop you, can it? :) Made my day reading this article, makes you certain that sometimes people have bigger problems than you. How can I stop connecting my students when passionate purposeful flames are fanned. I can't. 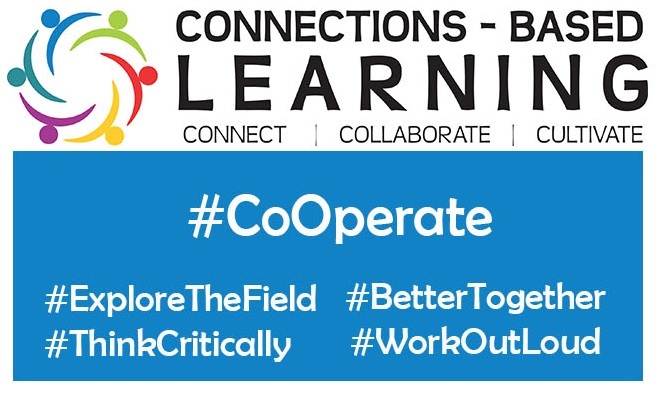 #ExploreTheField, #ThinkCritically, #BetterTogether, and #WorkOutLoud. See this post for details on that experience: #CBLchat and #TeachSDGs. The human element is huge in these instances. If I asked students to educate themselves in coding and design through YouTube they would not have gotten as far as they did with a human connection. We went through the CBL #CoDesign focus to not only tease out our direction, but guide our work. What a difference a connection can make! 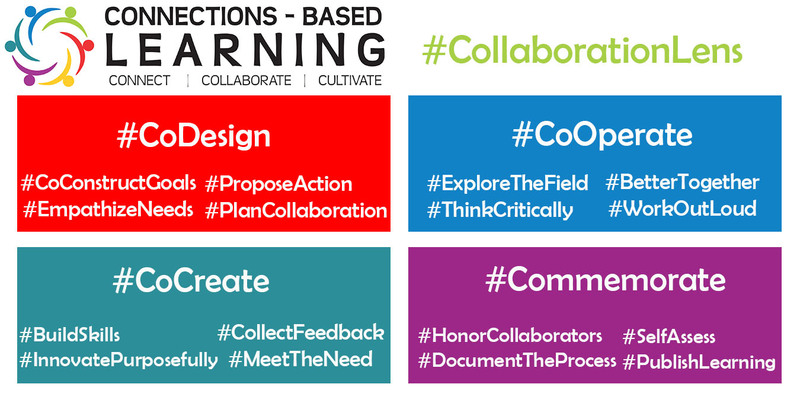 The CBL #CollaborationLens is a way to guide your connections. If you have no idea to what I am referring, you have got to check this out: Connections-based Learning. 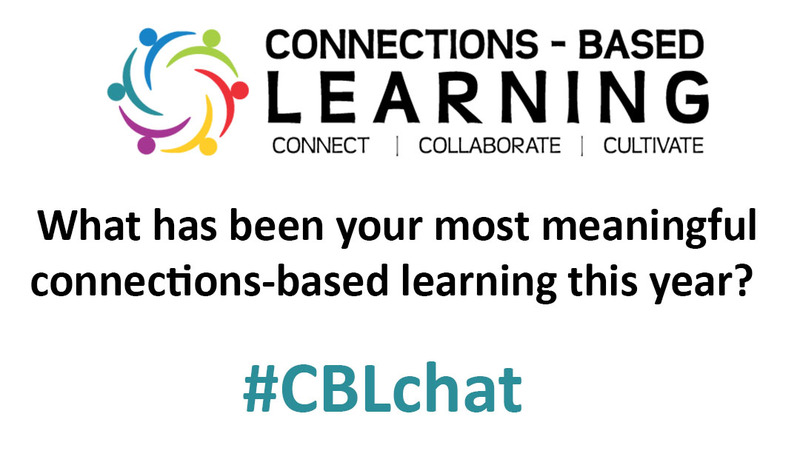 What has been your memorable connections-based learning this year? I would love to see your tweets, hear your stories, listen to your Voxes (join the: CBL Voxer Community!!) and read your reflection posts! My response is simple: Don't Stop. You have experienced the power of connection. You have seen the effects on your students and their learning. You have built meaningful connections that have made a difference for your students and possibly even the world around. Keep it going! In fact, I would ask that you consider other connections as you take next steps. Now that you have made some connections around the world, are there connections that need to be made right back in your own community? - Are there needs to be addressed in your own school? - Are your students mentoring younger students with the learning they have gained? 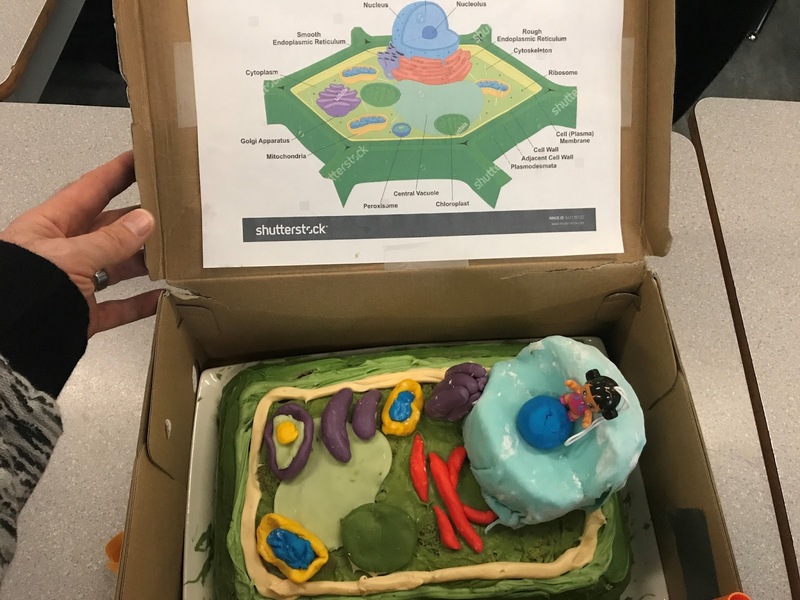 - Are there ways of connecting your class with another in the school to work on something cross curricular? - Are there needs in the neighbourhood that your class can address? - Is there a way your class can serve the local community? Are your students getting into things of which you are not the expert? GOOD! That is the way it is suppose to be. You are a linchpin now. How can you facilitate connections with the expertise your students need to go to the next level? - Into what topics is your class delving that an expert could add up-to-the-minute discoveries to the learning? - Is there a coding expert with whom you can connect your students as they develop software? - Is there someone that can help them MAKE in response to a connection? - Have you tapped into the expertise that is present in the parent community? We must keep mindful that there are others that are working on the same goals as us. When I speak of organization support, I am thinking of a two way street: how are we supporting the organizations that need our help? But also, how can organizations assist us in achieving our goals? - Are there organizations in which your students are passionate? - As your students consider the UN's Sustainable Development Goals, are organizations that they can work along side to address needs? - Have you seen a group offering mentorship opportunities in a certain area? - Is there a way to partner with local service groups to have a positive impact? Maybe you have been connecting with mentors, experts, and organizations, but you have not made a connection with other classes. A great way to open the door to empathy with your students is to connect them with other students. As I mention in the CBL book, the more we connect with those who are different from us, the more we develop who we are. - Is there a way your students can collaborate with another class as they pursue a certain learning outcome? - Are there connections your class already has through apps like Belouga that you have not pressed into? - Is there a way that your class can work with another on a common topic, interest, or goal? Do you have a fear of sharing? (and might I add, do you have fears or concerns about connecting in any of these ways?) What are the roots of this fear? How do they need to be addressed? 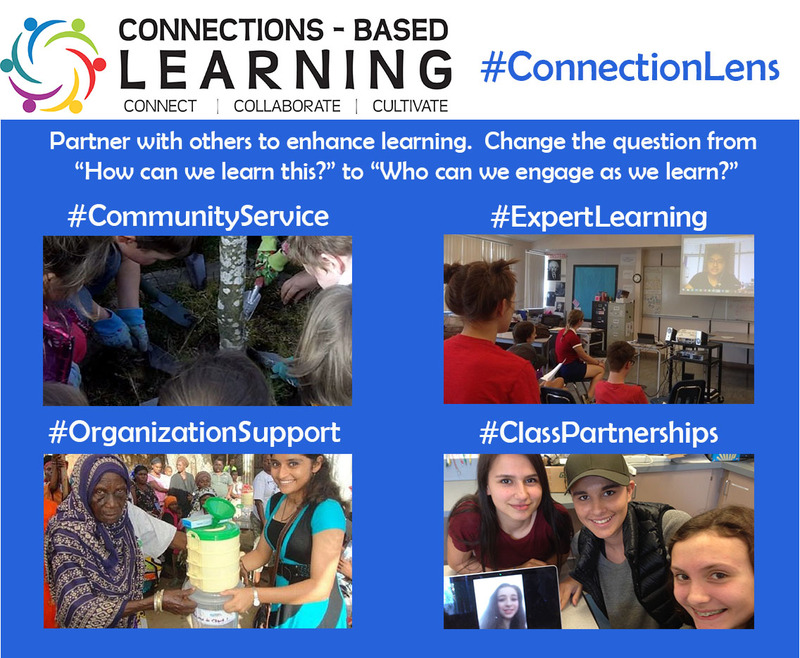 Donning a #ConnectionLens is only the start of an educator's connections-based learning journey. Educators around the world are connecting. They are using connection platforms. They are breaking down the walls of their classrooms. But that is not enough. I have made a case that connecting our classes opens the door for students to develop empathy. It provides students with up-to-the-minute knowledge. 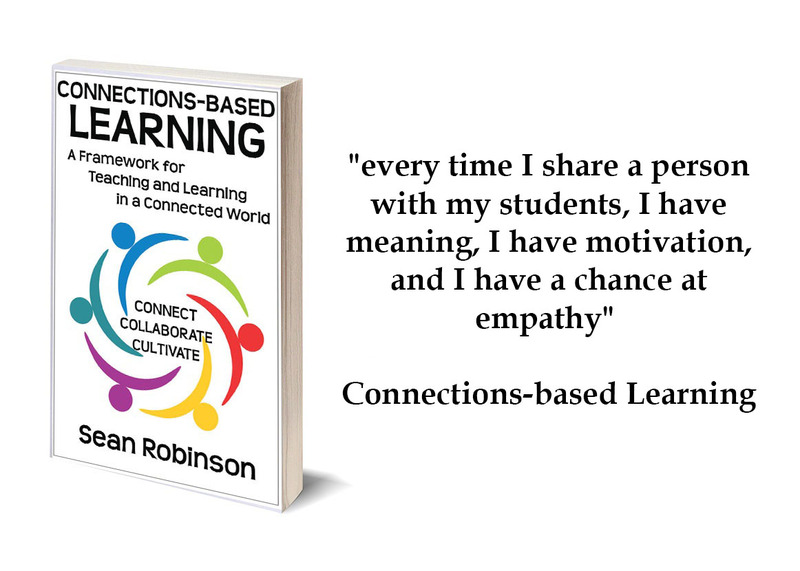 But if they don't do anything with the empathy that they have developed, if they don't do anything with the knowledge that they have gained, if they don't respond to a connection, a vital part of connections-based learning is lost. "Now that we know what we know, what are we going to do about it? What are we going to MAKE about it?" This returns the onus of learning back to the students and opens the door to individualization, differentiation, and personalization. Individualization is matching the speed of the learning with the students. If the learning outcome is based on connection, the typical teacher-imposed-timeline for concept attainment is thrown out the window. The teacher truly becomes the guide on the side as students develop their response to the connection. Students can take time to pause, follow a rabbit trail, delve into a topic of interest deeply, or dare I say skip over parts that don't interest them. 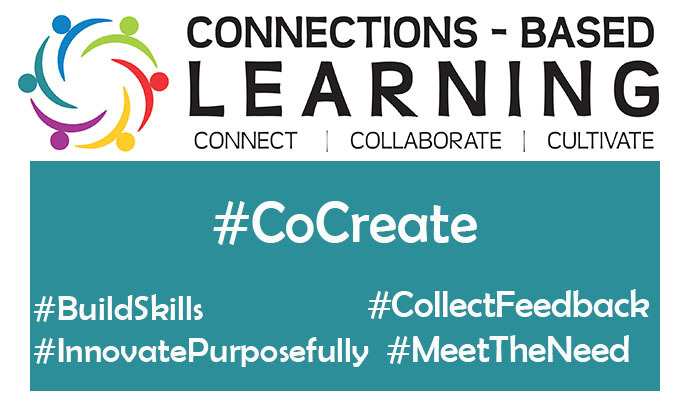 In connections-based learning, students #CoConstructGoals right at the beginning of the CBL. 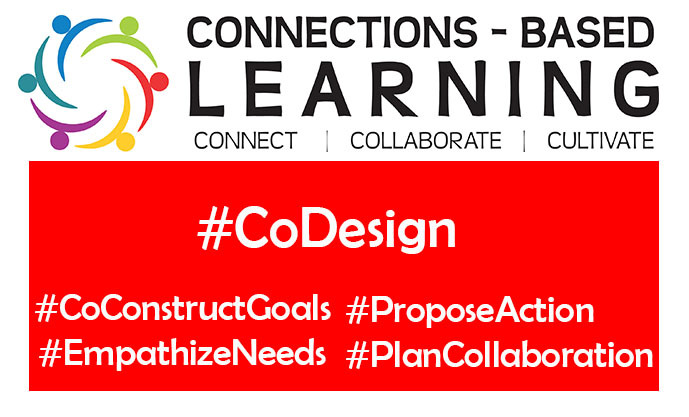 It is the responsibility of the educator to construct those goals with the student as they #CoDesign the connection response. Learning outcomes were considered as the learning partner was established. It is way too late to be establishing learning outcomes while students #CoOperate. They need their autonomy. They need time ... and check-ins to help them along their path. But Robinson, we have deadlines. We have report cards. The semester ends for goodness sake!! Yes, but student learning never does. Might I direct you to our CBL with Karishma Bhagani, creator of the low cost water purifier. The end of the semester did not end the learning for my students. Or what about our CBL with the Dominican Republic? Second semester classes were working with first semester classes to build and send the solar lanterns to the Dominican Republic, Macedonia, and Kenya. The course was over for some and yet the work, and the learning, never stopped. Semesters should not dictate the learning timeline; students should. As a guide on the side, the teacher is tasked with being the linchpin to support groups and individuals as they pursue their response to the connection. Each response is individual to the student. In no way can the teacher take over. It doesn't make any sense in this context. Differentiation, tailoring the instruction for the learner, is the only way that this can work. Learners may need to be connected with other experts to accomplish their goals. Learners may need to be guided to where they can attain needed skills. Let me assure you, as learners develop their own responses to a connection, they will be all over the map. 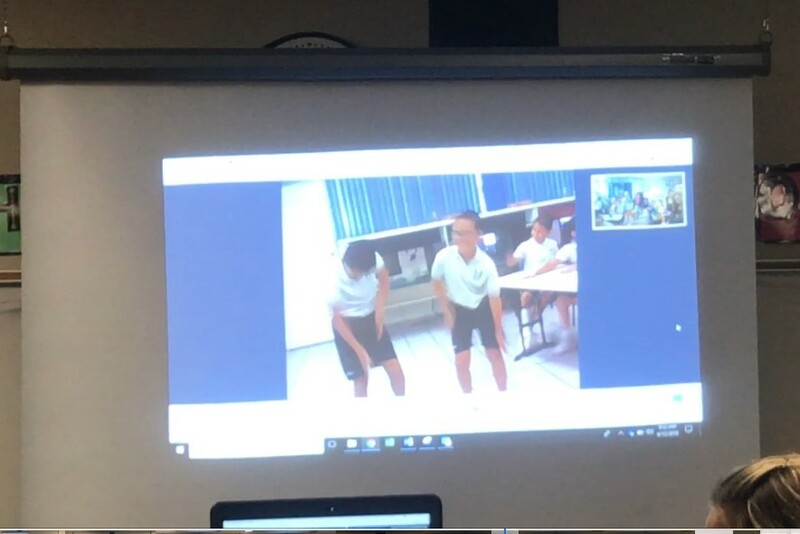 As students developed their response to their connection with the Dominican Republic students, students went off in all kinds of directions. And I wouldn't have it any other way! Personalization is where students drive their own buses. They pursue their own interests. As students make a connection with a learning partner, they are encouraged to respond in their own way. This "freeing up the student" allows the learners to follow their own path to a response. The door is opened for innovation, creating, campaigning, advertising, and fundraising. I love it when a student enthusiastically follows their own path but I believe a connection opens student's eyes to consider others as they do it. The connection is needed to keep the personalization from becoming completely insular. How can our students consider the needs of the class, community, and globe as they follow their path? This is where a sharing the Sustainable Development Goals can guide the students as they inquire and innovate. There are so many possibilities, so many needs, exposure to the SDGs expands the horizons of the students as they consider their response to a connection. As educators, it is our delight when students find their passion and follow their interests. My desire is to see more and more educators allowing for more and more students to do just that. As we seek to connect with learning partners in the community and around the world, and allow our students to respond, we naturally encourage individualization, differentiation, and personalization. How do you see this playing out in your classroom? In February, a couple hundred students at my school made connections with individuals in their community. We called the task, simply: Community Connection. 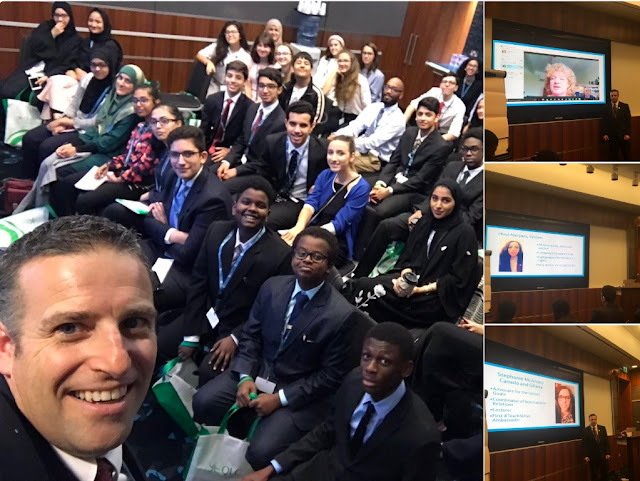 Students connected with professional photographers, music teachers, swim coaches, optometrists, neonatal intensive care nurses, website designers, oil and gas engineers, financial advisers, litigation lawyers, personal trainers, rugby players, dentists and dozens and dozens more professions. My lifework has been making a case for educators to look for a who as they attempt to achieve learning outcomes, to bring in the human resources available as educators teach their students, to see human connection as the best way to teach the whole child. The learning outcome we were addressing with our hundreds of grade 9's was: Explore volunteer and other new learning experiences that stimulate entrepreneurial and innovative thinking. Donning a #ConnectionLens means that exploring experiences like these leads educators to ask: who can we engage as we learn? 1) Choose someone who is involved with something that you are passionate about. This could be a job, a volunteer role, a skill, or a hobby. 2) Connect with this individual and plan a time when you can interview them in person or using technology during the first week in February. 3) Converse with the individual asking them the questions such as "Why are you passionate about your job?" and "What advice would you pass on to someone interested in what you are doing?" , as well as your own questions. Either record the responses or document them in written form. 4) Create a post on your digital portfolio account outlining what you learned from the interview and how it connects to you. Now I have to give credit to my colleague Phil Barrington for this amazing connections-based learning assignment. As we collaborated together, he passionately suggested this idea and wouldn't take no for an answer despite the seemingly colossal endeavour it seemed to be. 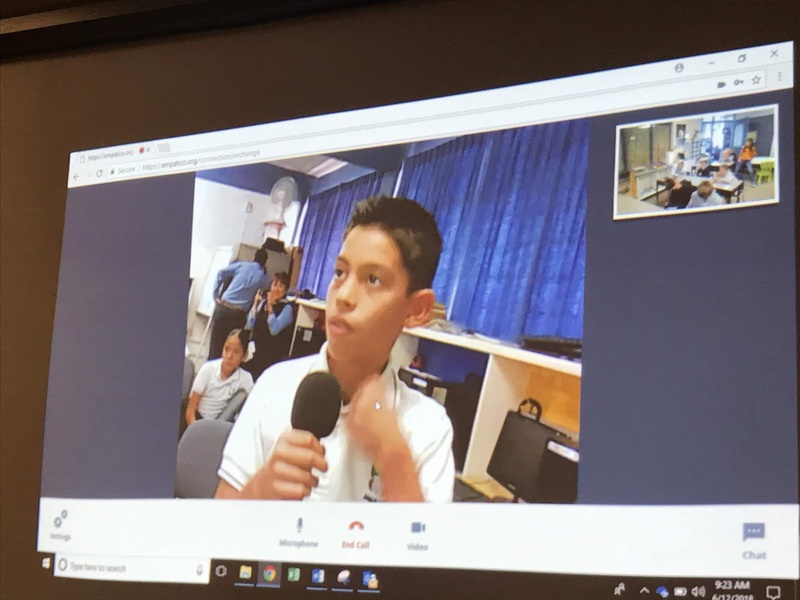 Imagine: meeting with students from a dozen classes, telling them that they had to find a connection, interview that person on their own time, and blog about the experience. Add to that the work to read through the hundreds of blog posts and comment. It was pretty huge. The student post (here) includes a conversation about passions, obstacles, and depression. The post knocks the learning outcome out of the park. Not only did the student hear how someone he looks up to turn his passion into his lifework but who knows what possibilities this connection could open up for the student. All this from an Instagram cold call that the student made to seek out a connection. 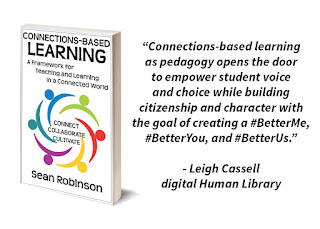 In chapter 5 of the Connections-based Learning book, entitled #ConnectionLens, I ask educators to strive to see the possibility of human learning resources around them. I share four connections to consider. Connections with: the community, experts, organizations, and classrooms around the world. I love how the Community Connection put two of these focuses together: #CommunityService and #ExpertLearning. I also love the skills that students practiced as they accomplished this task. Many students had to make cold calls and found positive responses to the question: "Hey, do you mind if I interview you?" 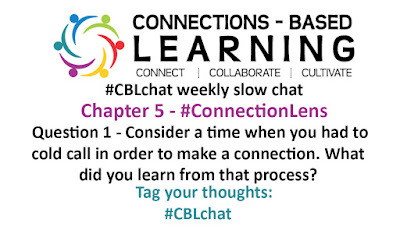 The #CBLchat Community question for the week considers that skill: Consider a time when you had to cold call in order to make a connection. What did you learn from that process? Consider adding your voice. Join our #CBL Voxer Community. 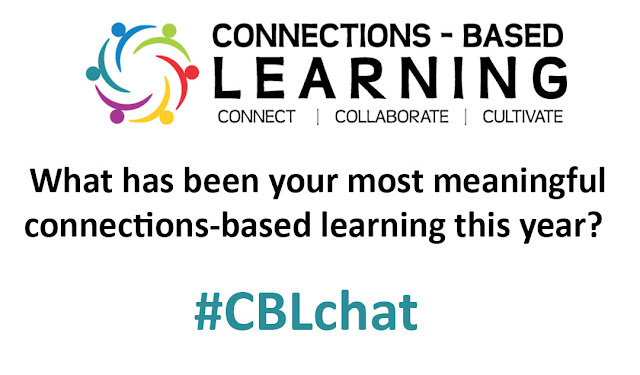 You can share your thoughts there, tweet them using the #CBLchat hashtag, or comment below. I would love to hear your thoughts and experience regarding cold calling in connections-based learning. What she put so eloquently is at the core of my desire for connections-based learning. That connection would be harnessed for learning. I love hearing about the CBL work going on around the world. Barbara Zielonka is a truly connected educator. One of the amazing works that Barbara created was a global collaborative project called "The Universe is Made of Tiny Stories". I remember her request for participation in September 2016 as she used the connection platform that Leigh Cassell, Nicole Kaufman and I created to connect educators for projects like Barbara's. 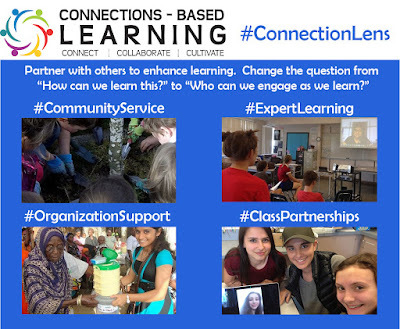 We created Connected Learning Partnerships (CLPedu) to spurn on #classpartnerships helping classrooms connect around the world. I love how Barbara used CLPedu as one of the platforms to help her find educators to join this amazing global endeavour. The hundrED article goes on to talk about how using connections-based learning has affected Barbara's teaching practice. Lessons became much more exciting as her students connected with "entrepreneurs, volunteers, ICT experts and CEOs from all over the world" And students learned how easy it is to reach out an connect "effectively and consciously". The article brings up a few good points that beg responses. First, is CBL the future of education? I believe so. With this fast-paced world, there is no way a teacher can be an expert at everything. Students will need to connect more and more outside the class to access that expertise. And collaboration cannot simply stay within the four walls of the class. Students need to collaborate globally to address some of the huge issues facing the world. CBL is crucial. 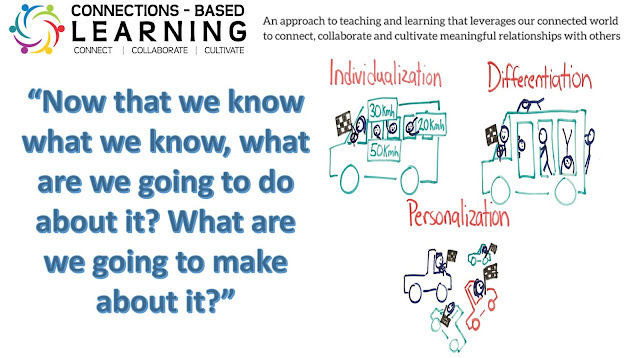 In fact, I actually believe that there could be a day where we don't use the term connections-based learning. We just call it learning and leveraging the connected world is just commonplace. Until that time, though, I soldier on sharing the importance of connections with as many as possible. The second point to address is the statement: "many feel they don’t have the time to utilize it – or don’t realize that they could!" I appreciate this statement. 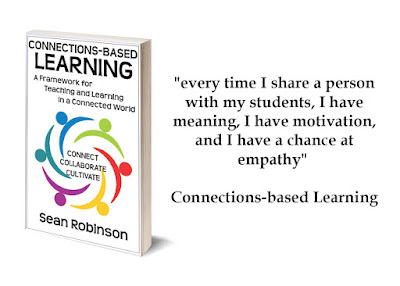 In fact, it is why I wrote the Connections-based Learning book. 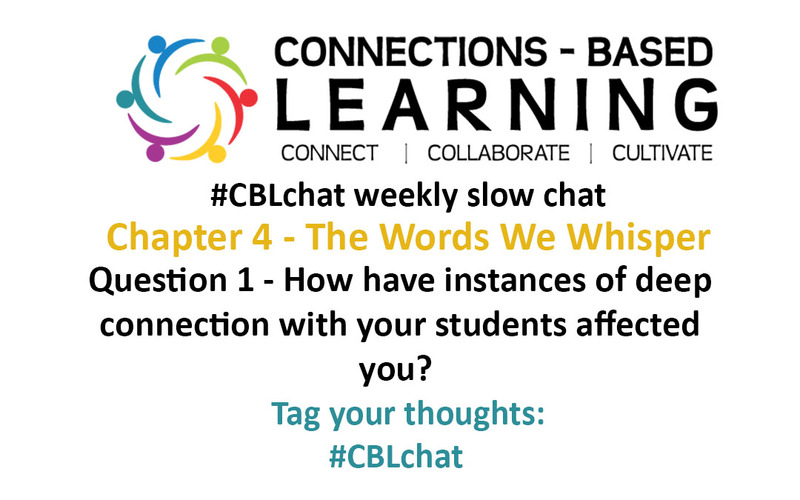 One of my hopes was to address the idea that some might feel that they have to "add" CBL to one's teaching load. They don't. As I explained in the book, CBL is about a way of seeing. 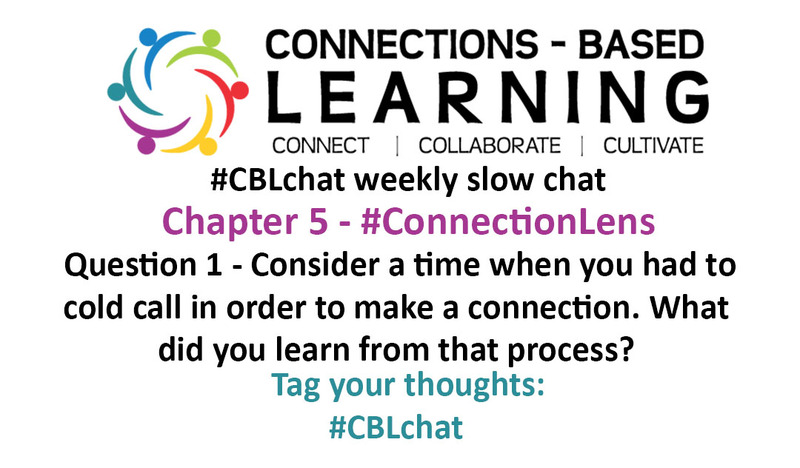 The #ConnectionLens causes us to seek out with WHOM we might connect to achieve a certain learning outcome. The #CollaborationLens helps us see HOW we might collaborate with learning partners to maximize learning. And the #CultivationLens reminds us WHY we do what we do. We don these lenses as we look at our curriculum. And it opens our eyes to understand that we don't have to do everything, to be an expert at everything as educators. We have to be linchpins to lead our students to the necessary learning partners and connections that can help do amazing things. 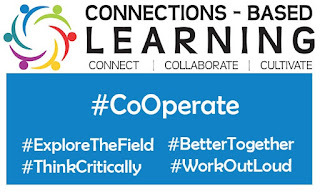 The article ends with some great examples of schools using connections-based learning: "if you’re excited to get going with connections-based learning, check out Education Cities, Liger Leadership Academy or Microcampus – all of which make the most of connections-based learning." I am very thankful to both Barbara Zielonka and hundrED for sharing out CBL and drawing attention to how vital an approach CBL is. 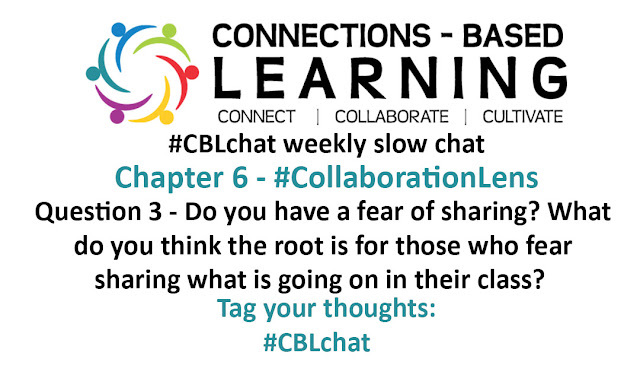 I start chapter 4 of Connections-based Learning by sharing my experience with one of my students, Amanda Todd. In that opening vignette, I reflect on both her life and her death. I tell of the challenges we had in the class. I tell of her heartbreaking story of online bullying and harassment, widely covered in the media. And I share my own reflections: what our connection taught me. Death is a tragedy on its own, but her story causes us pause as educators. I have had students pass away before. But not like this. A tragedy like this leads those around to shine the spotlight on themselves. I truly believe I connected with Amanda as her grade 7 teacher. Sure, she would often give me the "you're not going to make me do that work. It is just not going to happen" look. But she did it with a smile. Really, she did. We had a lot of laughs. And in the challenges she had with her work, her message to me was basically "you know this is not the way I learn. I am social. I learn while interacting with people. You should know that." And so we worked at it, as a team: parent, principal, learning specialist, youth worker, teacher, and student. As I reflected on my experience years later, a personal lesson reflected back. When we look out over our classes while teaching the formula of a circle's circumference or ohm's law, we have no idea the inner turmoil that some students are facing. We can't help but consider: does our influence as educators help the core of our students? In the words we whisper to our students daily through our actions and our interactions, are we whispering words of encouragement? Support? Inspiration? And do our students have someone in whom they can confide when things go sideways. 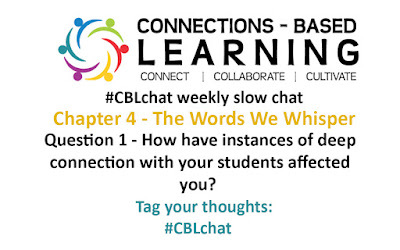 The CBL Community question for this week is: how have instances of deep connection with your students affected you? Another thing I learned from my interaction with Amanda was how important it is to have students be part of the lesson creation. When a student is saying "you are not going to make me do that work", they have a point. When we #CoConstructGoals with our students, we include them in the planning. It is not "the teacher's work" that they are completing, it is their own. I feel like I can open the doors wide for my students now. What do they want? Do they want to connect with a stem cell researcher? We can do that. Do they want to connect with an online gamer? We can do that. Do they want to represent their learning with a video, a play, a song, a cake? We can do that to. You guessed it. A plant cell cake from one of my grade 9's! Our students hold a wealth of possibilities for our own growth as educators. How have the connections you have had with your students affected you? Visit AmandaToddLegacy.org for resources regarding awareness and prevention of bullying and cyber abuse. plus materials on mental wellness and healthy living. One resource that caught my eye was the: Global List of Helplines. In this globally connected world, we need to start thinking bigger. I love how Carol and the Amanda Todd Legacy folk are doing just that as they direct teens around the world to helpful resources.